Sieds Stoop, who took the name of Brother François on entering the Taizé Community in 1951, was born on 11 August 1929 in Leeuwarden, in the province of Friesland, in the north of the Netherlands. His father was a lawyer. He had two brothers who died before him. Member of the Reformed Church of the Netherlands, he studied theology in Utrecht and then Geneva, where he defended his thesis on "The Spiritual Retreat" in July 1954. At that time, the preparation period was short and already after a year and a half, Brother François made his life commitment as a brother of Taizé at Easter 1953. He was still very young when Brother Roger entrusted him with important responsibilities. Beginning at the end of 1953, he was asked to visit regularly the community of sisters in Grandchamp, Switzerland, whose evolution he continued to accompany up until the end of his life. 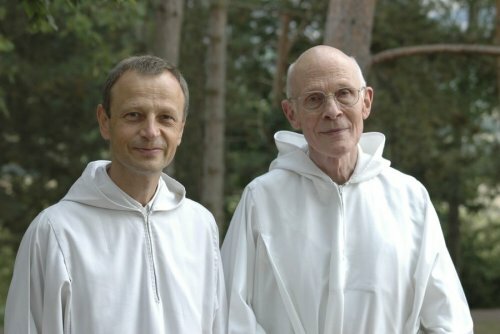 From 1954, he was asked to take charge of the preparation of new brothers in the Taizé Community, which he undertook over several decades using the exceptional discernment that he had received. In 1956, following the usual path at that time for brothers who had received the vocation of pastor before joining the community, Brother François served his period of pastoral practice in the Lutheran parish of Chagey, in the region of Montbéliard, France, where he was consecrated as pastor in 1957. Throughout his life, he shared many conversations with priests, pastors, religious brothers and sisters, from different countries, who in that way benefited from his pastoral experience. He was a musician. He played flute in the student orchestra in Utrecht and then the organ in Taizé. He composed several of the Taizé songs. He died suddenly on Thursday 18 October, 2018, during evening prayer. He had just begun his 90th year. He wanted his funeral to be made up of songs and prayers, with a minimum of words. The funeral was held on the morning of Sunday 21 October. One of his sisters-in-law and his numerous nephews, nieces, great-nephews and great-nieces were present. God of all human beings, we entrust to you our brother François. You call him now into fullness of life. His life has borne abundant fruit. When he was still very young, you called him to leave the Netherlands, his country, and join the Community. Always, he supported Brother Roger in the evolutions and changes that the Community went through: he was very conscious that in the adventure of our life together you call us to go from one beginning to another beginning. He was always animated by the passion for the unity of Christ’s body, your Church. Yes, his life has borne abundant fruit. You helped him to accompany so many people, with a deep understanding of the most diverse human situations. By his discreet and faithful presence, he encouraged the people he listened to to consent to the necessary processes of maturation in their lives. And he knew how to communicate his deep sensitivity to beauty in art, in music, and in nature. His love for your Word has left a profound mark on our Community. He let himself be guided by the risen Christ. He understood the words of Jesus: “I call you friends,” and he was able to transmit the confidence that these words imply. This friendship with Jesus is stronger than the evil that can exist in a human life and in the world. God of all love, we praise you for the life of our brother François. It has borne much fruit, fruit that will last.